Attention ALL Full-time Employees! 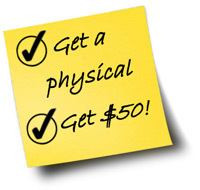 Complete your physical, have your doctor sign the Physician Affidavit Form, and receive a $50.00 gift card! And if your spouse gets a physical, they are eligible to receive a $50.00 gift card, too! If you have completed your physical any time after January 1, 2019, simply click on the link below, print out the form, and take it to your physician to certify and sign. Email your completed form to Corporate Human Resources at benefits@discounttire.com, or fax it to 480-951-8619 or 480-609-0995 by December 31, 2019. You’ll receive an email confirmation upon receipt of your form and your $50.00 gift card will be mailed to your address on file within 45 days of your confirmation. Questions? Contact Human Resources at benefits@discounttire.com or 800-347-4348. The deadline to submit the Physician Affidavit Form is December 31, 2019.